This tells you when your pan is ready for cooking. 1- Pre-heat the pan at high temperature for 2-3 minutes. Reduce the heat at medium-high. 3- If the water rolls around like a drop of mercury, you pan is ready. 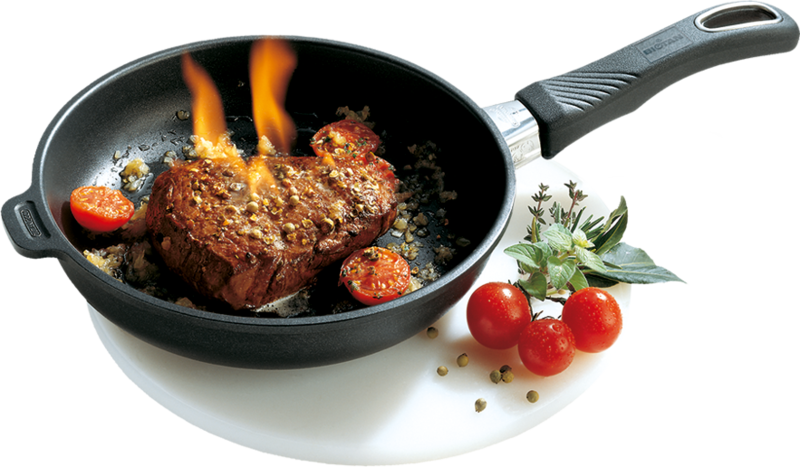 4- If the water is sizzle and evaporates, your pan is not hot enough. 5- When the pan is ready, dry off and then sear the meat and continue as recommended. 1- Pre-heat the pan without lid at high temperature. 2- Reduce the heat at medium-high. 5- Reduce the heat at medium and cook according to your taste. 5- Reduce the heat at medium and cook according to your favorite recipe. 6- Wash well immediately after each use or add cold water right away to the pan with a few drop of dish soap liquid until you’re ready to clean it. 2- Put directly the vegetable in the cold roasting casserole without water or fat, water from washing the vegetable is enough to start the steam. 4- Put at medium heat until steam appears. 5- Put at low heat and kept the lid on. 2- Reduce the temperature at Medium. 5- Brown each side about 5 to 10 min. 7- Cook 15 minutes per pounds, as of the moment you put the lid on. 8- You can add your vegetables 10-15 minutes before the end of the cooking. ** Item # 724 to 732 : 24 cm for 4 persons, 26 cm for 6 persons, 28 cm for 8 persons, 32 cm for 10 à 12 persons. 2- Put the roast directly into the casserole without any water or fat. 3- Sear each side at Medium-High temperature. 4- Add salt and pepper, spices, onions’ if desired. 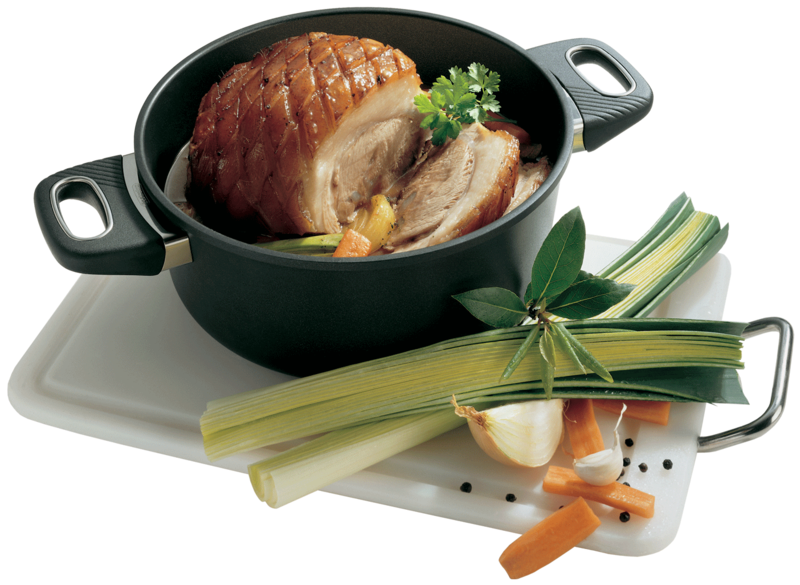 5- Reduce the temperature to Medium with the lid, if the steam escapes, reduce to low-medium heat. 6- Cook 10-15 minutes per pounds, as of the moment you put the lid. 7- You can add your vegetables 10-15 minutes before the end of the cooking time. Note: If there is no juice left at the end you perhaps forgot the lid or left the heat to high. 2- Sear and brown each side of meat at Medium-high temperature for 5 min. each side. 3- Leave the side of the fat downwards. 4- Add salt, pepper and herbs if required. 6- Cook according to desired doneness see grid for cooking time. 7- If you want gravy, remove the roast and prepare as per usually. 2- Prepare your cake mix as per usual. 3- Pour it in the casserole without adding any fat. 4- Put the lid on. 7- Remove the cake from pan, 2 minutes after removing from stove. Note: If you like to have a golden finish, remove the lid and put the pan in the oven at broil for 1 minute. Little tip: Chocolate cake doesn’t need to be golden. In the summer it’s very practical not having the oven on. It’s also practical for RV and camping. Water is not required; if you cook only a few vegetable (up to half of the roasting casseroles) add three spoonfuls of water. It’s important to put the vegetable in a Cold roaster pan otherwise this will stain your pan. During cooking always leave the lid on. Cook with water as described in your package instructions. Note that the time of cooking will be reduced. Cook without fat, use a lid to preserve the jus of the meat. No fat or flour needed, use a lid to avoid drying. ➢	Keep in mind the cooking time is reduced with the Gastrolux cookware as it keeps heat and the food continues cooking after it is removed from the heat sources. Check for doneness before the necessary time of your preferred recipes. ➢	Clean your Gastrolux while it’s still hot by adding cold water and soap. Use a rough plastic scrubber such as the 3M Scotch pad for washing the cookware. ➢	The warranty for the handle is 20 years and can go in the oven up to 500F (260 C). ➢	Heat will be uniform even if you use the largest frying pan on the smallest element of your stove. ➢	If you use a gas stove, make sure the flames do not over lap the sides of the pan because this could damage your handle. 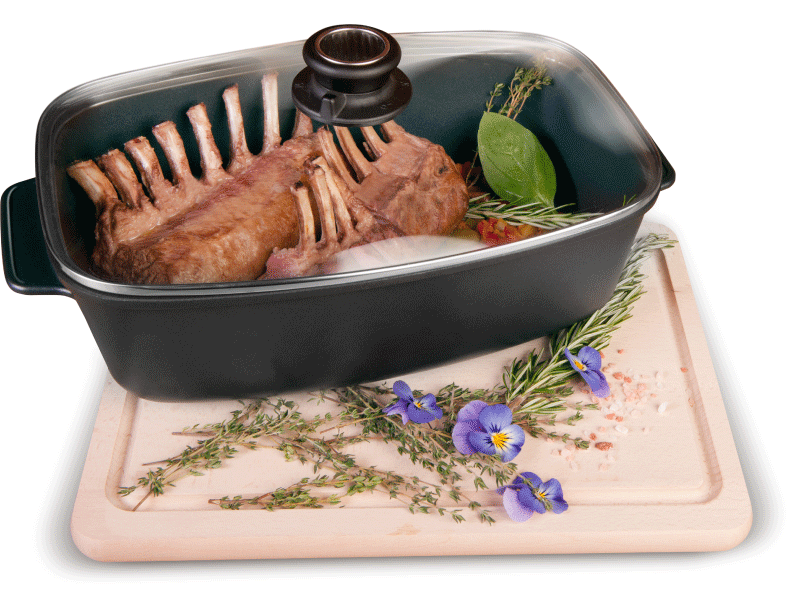 ➢	Gastrolux cookware can be used with or without Fat or oil. If you want to use oil for the taste, ensure you use one that can be heated at high temperature such as Gastrolux Vital rapeseed oil with a slight taste of butter (available in our authorized dealers, canola, avocado oil Important Note : olive oil should never be heated at more than medium heat.